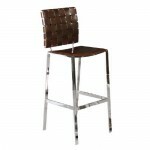 Our Numerous styles of bar stools and kitchen stools offer something to suite every home. The wide variety includes everything from traditional tall oak bar stools, weaved bar stools and retro swivel bar stools among others. If you want to warm up your country cottage or add some zest to your contemporary apartment, we cater for all tastes, traditional or contemporary, bold or sophisticated. The sheer array of colours offered is guaranteed to offer something for eveyone. Browse our exciting range of bar stools and kitchen stools, and get one step closer to the perfect bar or kitchen.